Often held to be the most attractive British large warship ever built, the battle cruiser Tiger began her existence as the fourth unit of the Lion class. Two ships had been ordered in 1909, one more in 1910, and Tiger in 1911. But just before she would have been laid down at the John Brown shipyard near Glasgow, Vickers launched a new battle cruiser for the Imperial Japanese Navy named Kongo. Kongo was an impressive ship, with eight 14-inch guns in four turrets laid out for maximum fields of fire. Sir George Thurston, her designer, had presented the Japanese with a far better ship than the Royal Navy's Queen Mary, laid down two months later. The British had been quite proud of their newest battle cruisers, nicknamed the “Splendid Cats,” but the fourth cat could not be built to an inferior design. Tiger in 1914, newly- commissioned and needing a crew. Tiger was re-cast into a near-sister of Kongo, though British publicists insisted that her improvements were evolutionary and followed the design of the newest dreadnoughts, the Iron Duke class. The claim's been picked up by some amateur writers since, as well as a few questionable Internet sites, but a quick look at the ships shows the strong Thurston influence and many naval journals listed Tiger as a “near sister” of Kongo. During the design of Lion, constructors had discussed moving the center (“Q”) turret aft into a position to fire over the aft-most (“D”) turret, giving a better field of fire and freeing space for more boilers, but this would have increased the cost of the Lion class ships, already the most expensive British warships ever built and the first with a price tag topping £2 million. Kongo’s appearance made the changes necessary for Tiger, and at £2.6 million she was costlier than the Queen Elizabeth-class fast battleships that followed and the most expensive warship built for the Royal Navy until the battle cruiser Renown hit £2.9 million thanks to wartime price padding. In part because of her high cost, her proposed sister, Leopard, was deleted from the 1912 program and eventually replaced by a sixth unit of the Queen Elizabeth class. Tiger displaced almost 28,500 tons and was 704 feet long, making her the Royal Navy’s largest warship until the commissioning of the battle cruiser Hood in 1920. In an effort to increase her speed she received a massive power plant, and she was the first British warship to generate over 100,000 horsepower. Yet she was only a half-knot faster than what Princess Royal managed with 70,000 horsepower, and paid the price of massive coal consumption plus the lesser protection common to all British battle cruisers. She would be the last British major warship provided with coal-fired boilers, and the only battle cruiser with a secondary battery of six-inch guns. Tiger was not complete when war broke out in August 1914, and manning her proved a problem. The Royal Navy faced unanticipated, massive requirements for crews for auxiliary craft — minesweepers, anti-submarine patrol craft and the like. Plus First Lord of the Admiralty Winston Churchill had hatched a boneheaded scheme to field a Royal Naval Division of infantry alongside the British Expeditionary Force in Flanders (thus allowing Churchill to meddle in the land war as well as the war at sea). This diverted 12,000 highly-trained naval ratings to infantry combat (requiring them to be re-trained) while new recruits and rusty reservists were being feverishly trained for the very skills held by these men. Many of the officers and seamen slated for Tiger and the new battleships Benbow and Emperor of India were diverted to the former Turkish battleships Agincourt and Erin. On Churchill’s instructions Admiralty mobilization plans had addressed the seizure of foreign ships building in Britain and allotted funds for their purchase, but no manpower for their crews. Tiger on gunnery exercises at Berehaven, late 1914. Nevertheless, Tiger sortied with the Grand Fleet's other three remaining battle cruisers during December against the German ships that shelled Scarborough and Hartlepool, not sighting the enemy. Unhappy with Tiger’s station-keeping, Beatty sent his fleet engineer, Capt. C.G. Taylor, aboard to improve her black gang’s performance and during Tiger's first action, the Battle of Dogger Bank on 24 January 1915, she consistently made 29 knots and led the British pursuit of the fleeing Germans. Her gunnery proved far less efficient: She blazed away at the German battle cruiser Moltke to no effect, then on her gunnery officer's initiative shifted her fire to the armored cruiser Blücher, obtaining just one hit and helping to confuse the gunnery of New Zealand. In all she fired 255 13.5-inch shells during the action, also obtaining one hit each on Seydlitz and Derfflinger. Neither was credited in official Royal Navy after-action reports at the time — and the fact that Tiger fired on every German large ship present does not speak to her credit. She also suffered three hits from Moltke. The first knocked out one of the guns of Q turret and killed two men, the second hit the ship’s signal distribution center, killing Taylor and seven ratings. The third struck her midships boat stowage, igniting the motor boats’ gasoline and causing a fire so massive that Moltke reported that her target had exploded, a result confirmed by the zeppelin L5. With her signals wrecked, Tiger veered off between the two opposing battle lines, somehow avoiding more damage but managing to mask the fire of her compatriots. Repairs would last two weeks. Pelly would show Beatty’s confidence well-placed, eventually retiring as a full admiral. But Fisher still required a sacrifice, and Tiger’s gunnery officer, Cdr. Evan Bruce-Gardyne, had to pay the price. Tiger’s gunnery had been “villainous,” raged the First Sea Lord, but the ship’s company manned the side as he left to cheer him, a mark that her crew was finally coming together. Once Fisher had forgotten the incident, Beatty helped shepherd Bruce-Gardyne back into active service and he finished the war as Lion’s captain. Pelly fought his ship better at Jutland, but again her gunnery proved abysmal. She suffered nine hits from Moltke in the first ten minutes of the battle cruiser action that began the battle, and never truly recovered. Half of her guns were temporarily put out of action, though three would be brought back into use, and for ten critical minutes she mistook the light cruiser Regensburg for Moltke and fired at her instead, allowing Moltke to return fire unmolested. Tiger did score the only certain hit by a British ship during the critical early minutes, striking Moltke, but she also mistakenly fired salvoes at von der Tann and Seydlitz to help confuse the other British ships' shooting. She did manage to hit von der Tann twice, putting four of her guns out of action, but New Zealand had to cease fire when splashes from Tiger’s shells obscured the German ship. Later in the action Tiger blazed away at the German pre-dreadnought division, managing to once again find the wrong target and obscure the fire of other British ships. In all, she expended 303 heavy shells, nearly her entire outfit, to obtain three hits. She also fired 136 six-inch shells, all of them at enemy capital ships in direct contravention of standing orders, for a total of zero results. In exchange, Tiger suffered 15 heavy shell hits, one from Seydlitz and the rest from Moltke. The most serious penetrated one of the six-inch shell-handling rooms and set off two shells there. The flash doors were closed and the magazines were not threatened, but panicked ratings flooded them anyway; leaking water also flooded Q turret’s 13.5-inch magazine. Repairs lasted exactly one month, and though Tiger saw brief action at Helgoland she never dealt or suffered any more damage. Tiger near the end of her service life, late 1920s. After the war Tiger served in the new Atlantic Fleet's Battle Cruiser Squadron. She survived the Washington Treaty cutbacks that sent her near-sisters Lion and Princess Royal to the scrapyards, and after a 1923 refit served for the rest of the decade as the fleet’s gunnery training ship. Refitted again in 1929, she then rejoined the Battle Cruiser Squadron from 1929 until 1931, while Hood underwent a major refit. On Hood’s return, she was deleted along with the Iron Duke class battleships to comply with the new limits of the First London Naval Treaty. Britain had sought the treaty to contain costs, and financial pressures made Tiger a logical choice for elimination. She was in very good condition, but would need a massive rebuilding to bring her to current standards. The treaty allowed such steps, but the Royal Navy's budget did not. Tiger could have been kept at the cost of one of the slow battleships of the R-class, as despite their 15-inch guns these were already seen to have limited military value. But new oil-fired boilers and turbines would have been required, and already the much less extensive conversions of the Queen Elizabeth class were running over £1 million each. Tiger was deleted in 1931 and went to the breakers the next year. Tiger is included of course in Great War at Sea: Jutland and makes many appearances in the game’s scenarios as well as scenarios in the supplements High Seas Fleet and Jutland 1919. 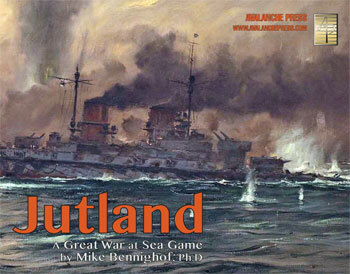 Send Tiger into action in Great War at Sea: Jutland. Mike Bennighof is president of Avalanche Press and holds a doctorate in history from Emory University. A Fulbright Scholar and award-winning journalist, he has published over 100 books, games and articles on historical subjects. He lives in Birmingham, Alabama with his wife, three children and his dog, Leopold. Leopold chases cats.